microWorld of Gems is an extensive resource on the internal world of gemstones—for the beauty they display and the information they reveal about their identity, origin, and sometimes, treatment. microWorld of Gems is pleased to represent the work of gemologist John I. Koivula, the leading authority in the world today on inclusions in gems and minerals. John Koivula has had a passion for the science of inclusions in gems and minerals since childhood. For him, a serious avocation led to a formal education in chemistry and geology, and subsequently, a career in gemology. His keen interest in the microworld of gemstones has produced seminal gemological research and the development of many new and useful techniques for photomicrography of gemstones. All books are still in print and are available through GIA (USA) and GEM-A (UK) bookstores. Stay tuned: mWG will unveil a new educational direction in the coming year. Meanwhile, explore the website & learn more about the fascinating microWorld of Gems! 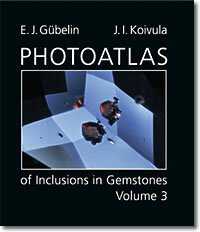 This Volume 3 completes the Photoatlas Library of Inclusions in Gemstones - a galaxy of superb photomicrographs by internationally acclaimed inclusionists Edward Gübelin and John Koivula. A beautifully produced collection of sunbursts of colour with scientifically significant explanatory captions.